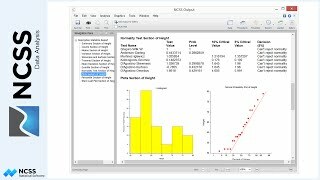 Hello and welcome to this tutorial on the operation of the NCSS Data Window, one of the four main windows of the NCSS statistical system. The Data Window is the first screen displayed when you start NCSS. The program terminates when it is closed. 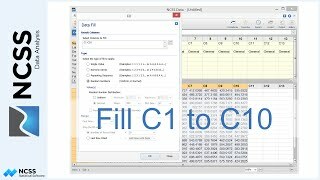 The Data Window lets you enter, view, and modify the information contained in an NCSS Dataset, which is stored as a data file with the extension .NCSS. The Data Window is comprised of two main sections: the Data Table and the Column Info Table. The Data Table has a white background and is always visible. It contains all of the data values in your dataset that will be included in analysis and graphs. The Column Info Table, which has a yellow background, stores information about each column in the dataset. It can be hidden or shown at any time by clicking on the Column Info tab. You can change the way information in the table is displayed by clicking the Rotate View button. In short view, the column info table remains in sync with the data table when you scroll among columns. In long view, the column info table remains fixed. 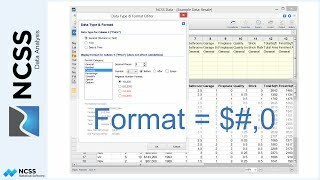 Click “goto” to bring a column in the data table into view. Both the data and column info tables have the familiar “spreadsheet” appearance. 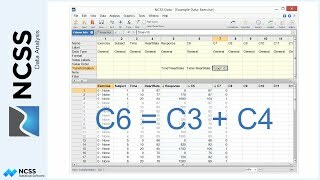 In fact, the operation of the Data and Column Info tables is similar to the operation of other spreadsheets with which you are probably already familiar, like Microsoft Excel. 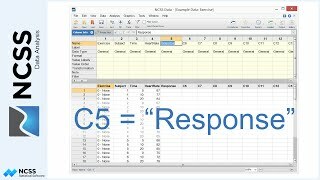 The main difference between the spreadsheet in Excel and the NCSS Data Table is that Excel is cell-based, where this table is column-based, meaning that all functions and display formatting are applied to entire columns, not individual cells. 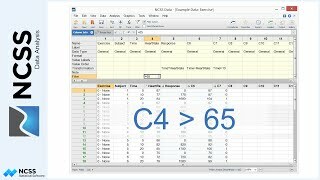 In addition to the Data and Column Info tables, the Data Window has various other components that assist you in modifying, viewing, editing, and saving data. These are the Menu, the Main Toolbar, the Transformation Toolbar, the Bottom Bar, the Data Entry Bar, and the Edit Toolbar. The first 4 items in the menu contain file, edit, view, and data options specific to the data window. 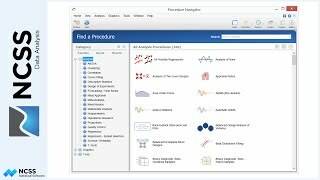 The next 5 are common to all 4 of the main windows in NCSS and allow you to select analysis and graphics procedures, select tools, navigate among windows, or get help. The toolbars are provided for single-click access to the most commonly used menu options. The Main Toolbar is located at the top of the screen just under the menus. On the left, it contains buttons and options related to the Data Window. Located on the right are navigation buttons to help you quickly move among the main windows in the system and load new analysis or graphics procedures. 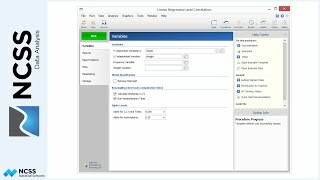 The Transformation Toolbar is located just under the main toolbar and contains options for creating and applying transformations. By default, this toolbar is hidden. To display it, select View > Transformation Toolbar from the menu. The Bottom Bar displays status messages and shows the location of the active cell. It also contains information about the active filter. The zoom tool on the right allows you adjust the size of text in the tables. 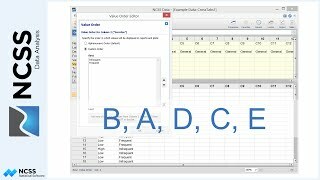 The Data Entry Bar provides an alternate place to display and edit data values. As you move around the tables, the contents of the active cell are copied here. Occasionally, your data will be longer than can easily be displayed in the cell. Press the expand/collapse button located to the right to change the size of the view. Or, click and drag the horizontal line just below the Data Entry Bar to resize it. 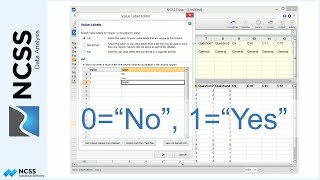 The edit toolbar contains cut, copy, paste, undo, and redo buttons that can be used to edit values in both tables. All editing can be undone and redone using the undo/redo buttons so you don’t have to worry about messing up your data, because anything you do can be undone. This concludes the tutorial on the data window.